Hayward has announced the all new Max-Flo XL Medium Head pump series. Incredible economy and performance combined with advanced hydraulicas and all of the latest conveniences. The Max-Flo XL is a self-priming, medium head pump perfect for all entry level new contstruction. 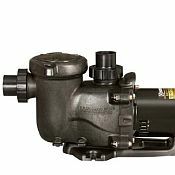 Max-Flo XL's advanced hydraulics delivers performance and reliability and with it's silent operation and exceptional value this pump will become a favorite with all pool owners. The Hayward Max-Flo XL pump series will be available starting May of 2012.